A police helicopter hovers over the land disputed by Nasa indigenous groups; in a process they call “Liberation of Mother Earth”. 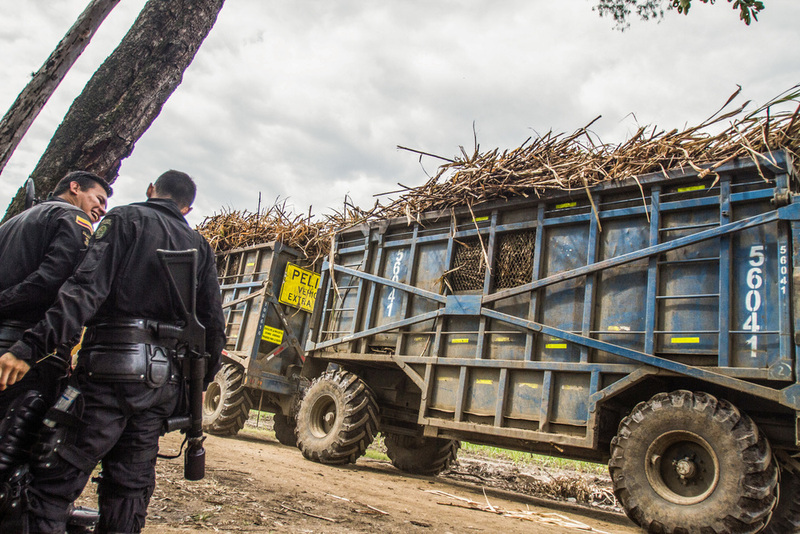 Nasa communities live in the mountains, and are claiming to the government to give them land in the rich valley, owned by sugar companies of Cauca department. 2015. 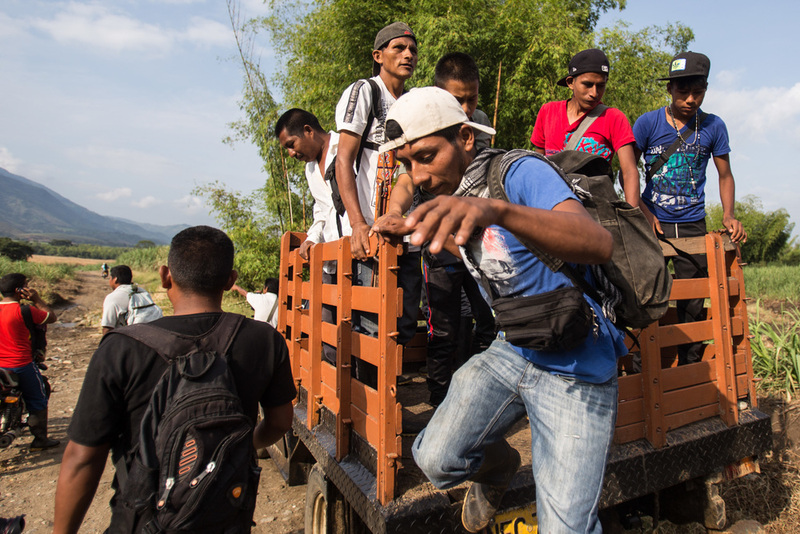 Members of the Nasa community travel from the town Corinto, to the land that they have taken and are fighting against government police and army forces, since late December 2014. Colombia. 2015. A group of Nasa with an improvised device that shoots fireworks in clashes against police units. 2015. A young man part of the Nasa community, knits a cap, he traveled from Tierradentro, south of Cauca department to support the Nasa community of the northern part of Cauca department, where they are taken lands. Colombia. 2015. Members of the Nasa community that have taken land in northern Cauca, coordinate with walkie-talkies the ongoing clashes against the police forces. Colombia. 2015. A group of young Nasa arrive to support the clashes against the police units in the land the community has taken. 2015. Clashes between police and some groups of the Nasa community in northern Cauca that have taken land. Colombia. 2015. Some members of the Nasa community, sit together in the camps they have built in the land taken, many camps for staying and cooking are spread around the land they have taken. Colombia. 2015. A Nasa woman attends a young man that resulted injured during clashes with the police forces in the land they have taken in northern Cauca department. Colombia. 2015. Members of the Nasa groups that have taken land, prepare to cut a road near the town of Corinto, in protest for the claim of their rights to the land. Colombia. 2015. Members of the Nasa groups that have taken land, take position under a bridge of the road they are going to cut, near the town of Corinto, in protest for the claim of their rights to the land. Colombia. 2015. A group of Nasa, stops buses to block the road near the town of Corinto, in protest for the ownership of the land in northern Cauca. Colombia. 2015. A young Nasa man stands in front of the roadblock during protest near Corinto in northern Cauca. Colombia. 2015. Members of the ESMAD, special police unit, fire tear gas to stop the roadblock made by members of the Nasa community near Corinto town. Colombia. 2015. A man and a child walk next to a member of the ESMAD Police unit who previously clashed with members of the Nasa community that has taken portions of land in northern department of Cauca. Colombia. 2015. 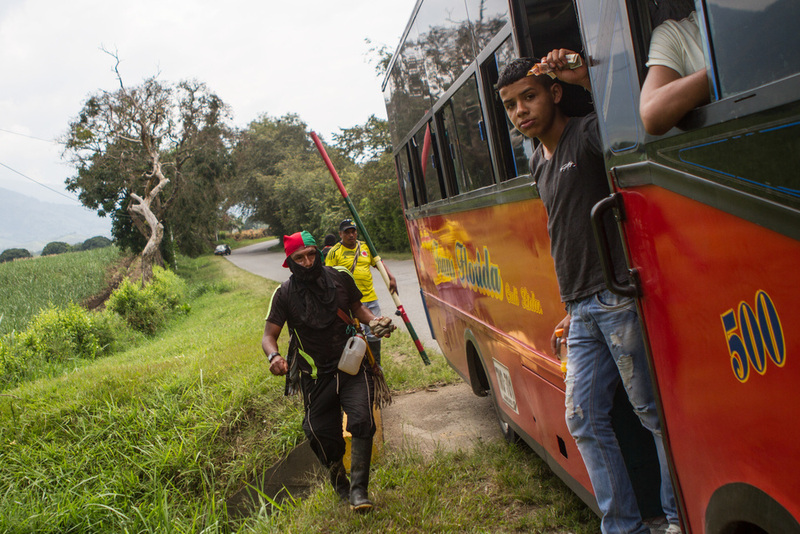 Members of the “Guardia Indígena” Indian Guard, who have the responsibility of the security of the communities and their leaders, travel through the land they have taken to different secret campsites. Colombia. 2015. Some members of the Nasa community , prepare food in the camps they have built in the land taken, many camps for staying and cooking are spread around the land they have taken. Colombia. 2015. An officer of the National Police ask questions in a check point in the town of Corinto in northern department of Cauca. Colombia. 2015. Feliciano Valencia is a well-known and respected leader of the Nasa community, is seen seated in the town of Santander of Quilichao, while he waits on the result of the legal audience against members of the Nasa community. Colombia. 2015. ESMAD police officers rest in the premises of the land owned by Sugar companies, near where the Nasa community has taken some land. Colombia. 2015.